APR’s ECU upgrade increases the vehicle's top speed limiter for blistering sprints around the track or across the Autobahn without the speed limiter shutting npipen the fun. Click on the tabs below to learn more about each stage. APR’s Stage I ECU Upgrade is designed for vehicles with little to no modification. Expect higher peak numbers of 310 horsepower and 311 ft-lbs of torque, but also gains of up to +57 horsepower and +58 ft-lbs through the power band. When running the intake specific software with a full high flow intake, more gains can be had. Expect higher peak numbers of 337 horsepower and 309 ft-lbs of torque, but also gains of up to +72 horsepower and +61 ft-lbs through the power band. APR’s Stage I+ ECU Upgrade requires an APR High Pressure Fuel Pump and is designed for vehicles with little to no other modification. Expect higher peak numbers of 337 horsepower and 337 ft-lbs of torque, but also gains of up to +77 horsepower and +81 ft-lbs through the power band when combined with APR's intake specific software and a full high flow intake. APR’s Stage II+ ECU Upgrade requires an APR High Pressure Fuel Pump, an APR Race DP Exhaust System and a full high flow intake. Expect higher peak numbers of 362 horsepower and 370 ft-lbs of torque, but also gains of up to +103 horsepower and +111 ft-lbs through the power band with all of these modifications. APR’s Stage III ECU Upgrade is included with APR’s Stage III Turbocharger System at no additional cost and is not sold separately. To learn more about APR Stage III, visit our Stage III product page. APR’s Motorsport Launch Limiter is an optional feature that eliminates turbo lag and provides a user adjustable launching RPM to aid in vehicle acceleration from a complete stand still. Simply hold the clutch and accelerator while the vehicle is stationary and the engine’s RPM will hold at a predefined limit while boost pressure builds using a “clean,” catalytic converter safe, strategy. With the vehicle stationary, handbrake applied and clutch disengaged, the driver can set the launch RPM by raising the engine’s RPM and pressing the brake pedal to set and save the desired launching RPM. With practice, this method can result in violent acceleration off the line! This feature is for manual transmissions only. APR’s Motorsport No-Lift Shift is an optional feature that allows the driver to maximize acceleration by reducing power, boost and time lost during a gear change. With the vehicle above 20 km/h and the accelerator pedal held above 98%, during a gear change, the strategy activates. The throttle remains open and boost pressure is not vented, resulting in more power immediately after a shift. This is achieved using a “clean,” catalytic converter safe, strategy, while the ECU automatically sets the appropriate time necessary for a torque intervention, allowing proper syncro alignment. No end user adjustment is necessary. The driver simply focuses on shifting as fast as possible! This feature is for manual transmissions only. *Stock as reported by both VW USA and VW AG. High output Golf R used for APR's advertised figures. **Stock as measured and estimated by APR using 93 (R+M)/2 fuel. APR’s EMCS, Enhanced Modular Chipping System, brings selectable programs and features to your factory ECU, all without the need to purchase external hardware. EMCS has the ability to rewrite the operating map data, giving each map new and specific calibration for increased performance. EMCS is available at any APR Stage. Program switching allows the user to cycle though up to four different engine calibrations and operating modes all without the need for external hardware. 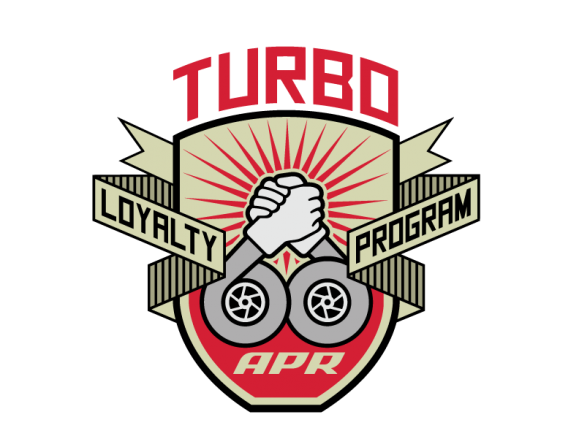 APR's Valet Mode protects your vehicle from becoming an expensive toy for unauthorized individuals. By enabling Valet Mode, the vehicle's engine and top speed will be greatly limited. APR's octane-specific calibrations are available for various premium and race fuels around the world. Each performance mode is a completely new calibration, altered specifically for the characteristics of the fuel quality selected. Currently available octanes are 91/93/100 (R+M)/2 in North America and 95/98/104 RON in the rest of the world. In some situations, APR supports higher 104 (R+M)/2 octane race fuels at Stage III power levels.